U.S. Olympic Basketball Teams Will Stay On Cruise Ship In Rio : The Torch This isn't the first time the U.S. men's basketball team is staying outside the athletes village where most Olympians will be housed in Rio. 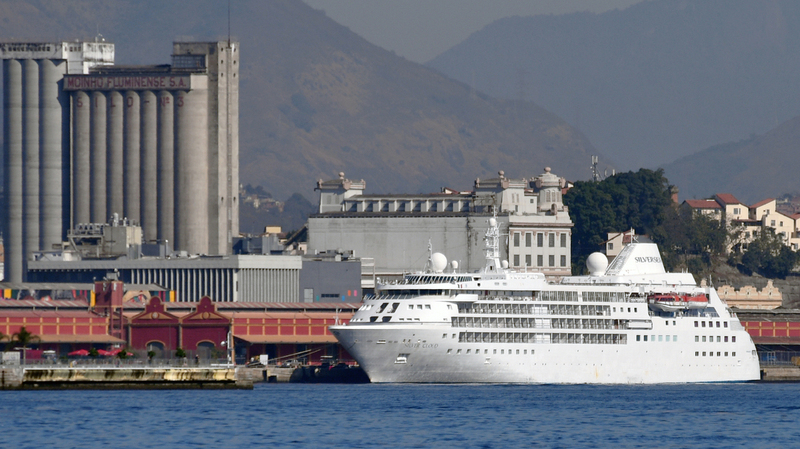 The U.S. men's and women's basketball teams will reportedly stay on the Silver Cloud cruise ship rather than the athletes village during the Olympic Games that start in Rio de Janeiro on Friday. The cruise ship is shown here on Monday at Rio's Maua Pier. In a move that could be interpreted as indulgent or prescient — or both — the U.S. men's basketball team at the Rio Olympics will stay aboard a luxury cruise ship rather than the spartan facilities at the athletes village. It appears the U.S. women will also be living aboard the Silver Cloud, according to media reports. The men's basketball team, made up of 12 highly compensated NBA stars, has a tradition of opting for upscale digs ever since professionals were allowed to play in the Olympics in 1992. And the men's team even stayed on a cruise liner once before, at the 2004 Games in Athens. Meanwhile, Olympic organizers have been dealing with complaints of incomplete or malfunctioning facilities in the dormitory-style apartments that will house the more than 10,000 athletes at the games. As Merrit Kennedy reported for The Torch, the Australian team has dealt with several problems, from plumbing and lighting issues to a fire and theft. NBA player Andrew Bogut, who's in Rio to play for his native Australia, tweeted a photo of himself "putting together a shower curtain so we can shower and not flood the place." U.S. players are not anticipating any such problems. "USA Basketball teams haven't stayed in the Olympic Village since the 1988 teams did," says the federation's chief media officer, Craig Miller. He adds, "Our teams are extremely active in supporting their U.S. teammates." Many players, including LeBron James, a veteran of the past three Olympic teams, but not this one, took part in off-the-court events, attended other competitions and hung out with athletes at the Olympic Village. "Rio tourism official Nilo Sérgio Felix told UOL two transatlantic liners will be used to host high-profile guests during the games. One will be home to the so-called Olympic family — International Olympic Committee members and insiders — and the other to guests of a 'multinational company' and the group many around the world still refer to as the 'Dream Team.' "
Miller confirmed that the male basketball players aren't the only ones who'll be staying on what has now been identified as a cruise ship with nearly 200 rooms. He says the ship was retained by computer network giant Cisco, which sponsors both USA Basketball and the International Olympic Committee. "The Silver Cloud, which docked at the city's port at the weekend, can accommodate up to 400 people in its 196 cabins, some of which have already been allotted to the U.S. men's and women's Olympic basketball teams, the general directorate of the Maua port terminal said." We contacted USA Basketball's women's team to ask about their housing arrangements, but got few details, with a team representative citing security policies about lodging. The U.S. men have their first game on Saturday, when they'll face China. The women will play their first game on Sunday, against Senegal. An earlier version of this story incorrectly identified Cisco as a food company. It is a computer networking company.